Adventure in Interzone is an Eamon adventure written by Frank Black. Adventure in Interzone is Frank Black's first Eamon adventure, written in 1994 and significantly updated for Eamon Deluxe in 1997. It is an eclectic and comedic adventure, its subject matter crossing from medieval fantasy to science fiction to contemporary settings. While Interzone draws its influences from a diverse range of sources, such as Michael Moorcock's fantasy novels, the film Pulp Fiction, and The Steve Miller Band, its primary source—whence characters Doctor Benway and A.J. Cohen, the "weapon" Steely Dan, and the setting of Interzone itself are drawn—is beat author William S. Burroughs' novel Naked Lunch. Adventure in Interzone often "breaks the third wall," with notes from the author and references. This is especially notable in the Eamon Deluxe version, in which Frank Black (d.b.a. Frank Kunze) and Tom Zuchowski appear; at one point, the character A.J. vocally laments the unavailability of Eamon adventure disks in Interzone. A number of characters appearing in Black's other adventures and The Jim Jacobson Adventures Deluxe make their first appearance in Adventure in Interzone. The backstory for the adventure involves the adventurer's raising the ire of Hokas Tokas, having rifled through the wizard's rooms and drinking his potions while the wizard was off pursuing a dragon. Upon his return, Hokas banishes the player to the Interzone, an "international and inter-dimensional zone" on another planet, surrounded by impassible storms, possibly kept alive by artificial, magical means. Hokas, it is revealed, frequently banishes those with whom he is angry to Interzone, having at one point transported an entire shop from Seattle to the island. There are a number of segments to the adventure, although the plot of each is reducible to the player trying to escape the current location and return to Eamon in one piece. Tom Zuchowski gave Interzone a score of 8, taking care to mention that the reader would likely rate it more highly. Zuchowski called the adventure "one of the most sophisticated Eamons ever done," noting that the attention paid to the puzzles and plot yielded a "puzzler's delight." Zuchowski also gave the adventure a difficulty rating of 8. While the "Interzone" of Naked Lunch referred to the international zone of Tangier, the "Interzone" of Eamon is politically robust, with its own Customs Service and military, the "I.Z. Army." It is bounded to the north, south, and west by a polluted ocean so toxic that the player will take damage upon entering it. The main island of Interzone is described as "53 miles long by 68 miles wide" with a number of smaller islands in the archipelago. Either through storms or magic, entering and exiting Interzone is nearly impossible save for extraordinary measures. Due to the virtual inaccessibility—and the lack of extradition treaties—the island is popular for both fugitives and victims of Hokas Tokas' wrath alike. A further nation-state encountered in the adventure is that of "Freeland," a parody of Washington, D.C. with rejoinders to "pay your taxes" and inhabited by men in uniformly gray suits. It is indirectly suggested that the President of this state is none other than Dave McFenney, the nephew of Shylock McFenney. Although the means of entering Freeland from Interzone during the adventure are rather severe, involving a trek through the "Land of the Dead," characters in the adventure seem to pass between the two states with ease. These two locations are literally on another planet than that of Eamon, as the adventurer escapes to the Eamon by use of a rocket ship housed at Freeland's Hall of Science. A third location, Albadania, is mentioned only indirectly during the adventure. Black offers two walkthroughs for the Eamon Deluxe version, replicated below, a "Civilized" method and "Barbarian" method. The former assumes that the player has at least 2000 gold. Give your weapons to Customs Official, go east, BLAST the thief to death and take his weapon, go to the cafe, buy (by REQUESTing) your weapons back, buy the I.D. tag. Go to the tavern (USE I.D. to get in), GIVE 500 to Kim, ATTACK the drunks, go to the pawn shop, EXAMINE the junk, GIVE 200 to Big Bob, GIVE the uzi and ammo clip (which is inside the ammo case) to Kim, walk around until the thugs show up. Go to the cafe, wait (SMILE or something) until the waitress leaves, go to the curio shop storage room, back out, CLOSE the door, go to the hotel, GIVE 50 to the waitress, go back to the curio shop, let A.J. out (OPEN the door). If Kim won't let you leave (by going down from the waitresses room): Go to the tavern GIVE 4 to the bartender, drink until its gone, repeat. HEAL yourself, get items from A.J., go to curio shop, get any items from store room, GIVE idol to merchant, go to pawn shop, GIVE pawn ticket (if A.J. had one) to Big Bob, GIVE 50 to Big Bob, get your stuff, GIVE 50 to Clem Snide and REQUEST if he has anything of yours. REQUEST anything of yours from Mary and Kim. Go to empty hotel room, EXAMINE bed, get flashlight, go to waitresses room, go down, light flashlight, go east, go north, read sign, go east, go east, if Doctor Benway has any of your stuff, GIVE 50 to him and REQUEST it all back. Cast Power, go straight east to the Vengeance Club, kill Mondain, get the lizard skull, go west, south, east, GIVE the skull to Joe the Dead, go south, bribe the tunnel guard (GIVE 300 to him), leave the tunnel, go west, up, down. Check the Atari storage room for any items of yours which might be there, USE the computer in the hall of science, ask about "ROCKET", BOARD rocket, kill troll, free elf (with A.J. 's silver key necklace, go south, BOARD horse, south. Kill the dragon, and go north or south to return to the Main Hall. Kill the Customs Official, go east, USE the I.D., enter the tavern, hire Kim (GIVE 500), kill the drunks, go to the pawn shop, EXAMINE the junk, GIVE 200 and get the stuff (Note: You can kill Big Bob if you don't want to pay him- Just make sure that NOBODY except for A.J. is with you if you choose to do this! ), GIVE the uzi to Kim, open the case, REMOVE the clip and GIVE it to Kim, go to the hotel, EXAMINE the bed, get the flashlight, go to the Curio shop, go into the storage room. Back out of the storage room, CLOSE the door, walk around until the thugs show up, go to the cafe, wait for the waitress to leave, go to the hotel, GIVE 50 to her, GIVE 50 to Clem Snide (it's time to get yourself an army), go release A.J..
Go back to the cafe, GIVE 50 to the cook, go south to the beach, kill the crab-man, go back to the hotel room (the empty one, not the waitresses room), drop ALL of your stuff, REMOVE and drop your armor, go to the tavern. Buy a few drinks from the bartender, drink up until you pass out (8 beers, 4 ales, or 2 Death's Grips), HEAL yourself, WEAR your armor and get all of your stuff, meet A.J., INVENTORY him, REQUEST the idol, go to the curio shop. GIVE the idol to the owner (you'll get all of your gold back), go back to the tavern, buy another drink (remember, you're a barbarian!) and meet up with all of your companions, go to the waitresses room, go down, LIGHT the flashlight. Go east, north, READ SIGN, go east, east, kill mutants, GIVE 50 to Doctor Benway (Note: Even though he follows you around, he is neutral and won't fight until you hire him, and he is a good fighter to have on your side), cast POWER. Go east, east, kill everybody (if they run away, hunt them down! ), make sure you don't go north from the Valley of the Dead, get the lizard skull that Mondain drops, go to Joe the Dead's house, GIVE the skull to him. Clear the tunnels, kill the tunnel guard, leave the land of the dead. Go west, up, down (or just SAY +MAZE) to leave the maze. Go to the hall of science, USE the computer, ask about ROCKET or CODES. BOARD rocket, enter codes, kill troll, FREE captive with A.J. 's silver key necklace, go south, south, BOARD your horse, go south, kill the dragon, fight with Edgar until he leaves, get all of the treasure and return to the Main Hall. The denouement of Interzone sees a return to The Beginners Cave, which is "Out of Order" at the time of Interzone. 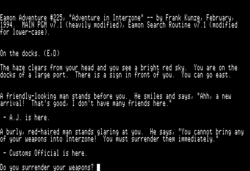 The adventure references the player's previous exploits, one being a previous encounter in The Death Star. On the ProDos version of Interzone, a number of unused entries in the EAMON.DESC file are filled with lyrics from the band Pearl Jam. This page was last edited on 24 February 2018, at 06:50.